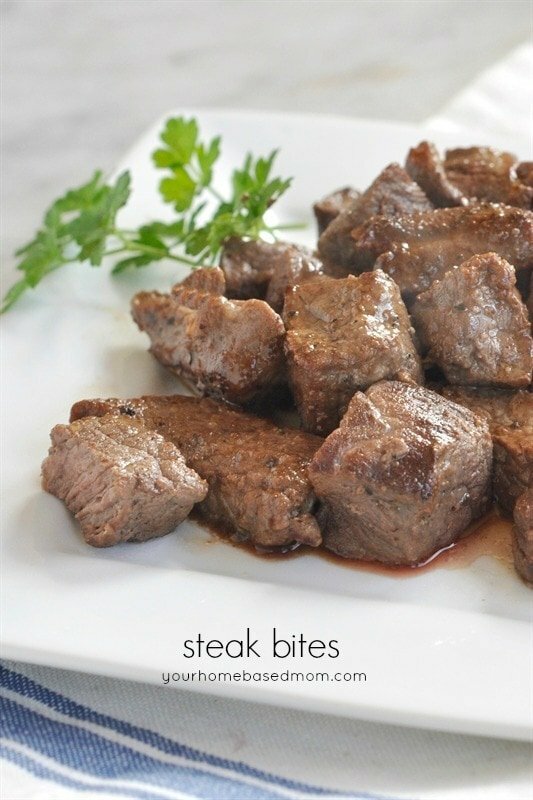 Steak Bites is a delicious and easy way to prepare a delicious steak meal. This three ingredient dish is the perfect thing to feed all the men in your life! 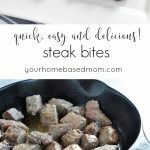 If you love steak, but want a quick and easy way to prepare it indoors, these steak bites are for you! 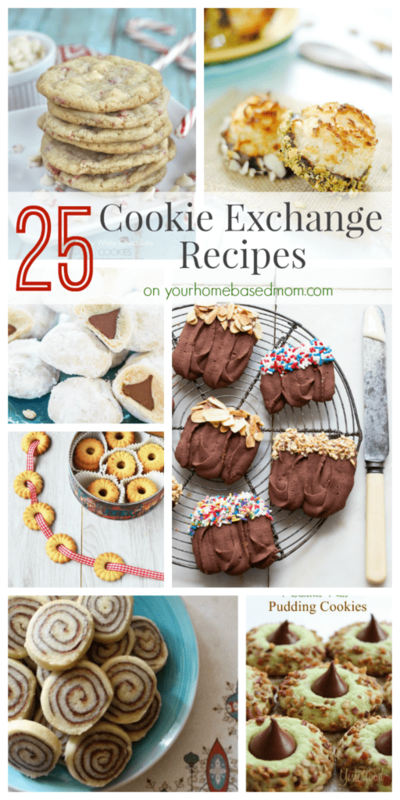 I have made these twice in the last few weeks because they are so easy and delicious. 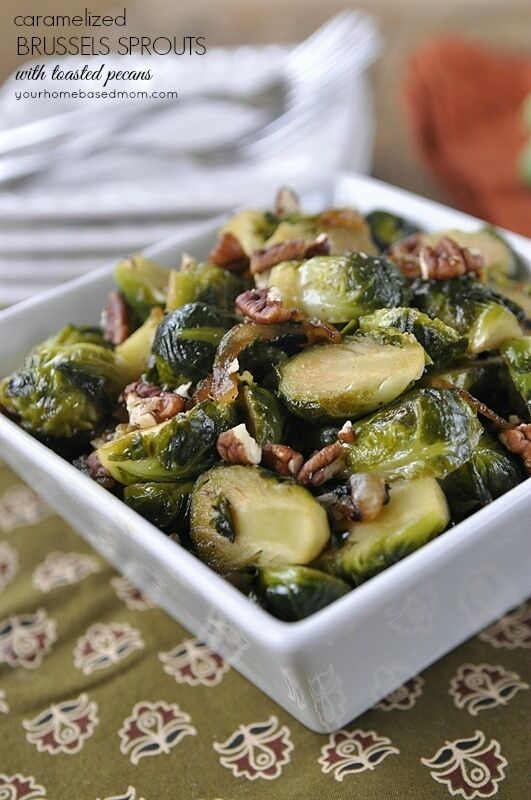 If you are eating Paleo or Whole30 these are a great recipe choice! I made this dish the first time for my husband right before he left for a week long business trip. I wanted to fix him a hearty steak and potato dinner before he left. For my Idaho boy there is nothing he likes better! But steak bites are great when you have lighter eaters at your dinner table too. No need to deal with a large piece of meat. Just take as many bites as you like. No waste! The Steak Bites were so yummy and so incredibly quick and easy to prepare! I started with a nice piece of Sirloin Steak and cut it up into large bite size pieces. The trick is to cook them up in a cast iron frying pan with some butter. Make sure your pan is nice and hot. Just cook to your desired doneness. I like my meat medium well. And the small pieces make the cooking time quick! So make sure to watch your meat. I served them with some roasted sweet potatoes and a spinach salad. I use my cast iron pan for so many things it really is a must have in the kitchen for me. In fact I have 3 of them!! Juicy and flavorful steak cooked indoors in half of the time with this steak bite recipe. Yummy! I’ve been thinking about making those! I’ve tried SEVERAL of her recipes…there was not one that I have not liked! Her chocolate pie is AMAZING! Seriously. I liked the marlboro man sandwich and lasagna, and bacon wrapped jalapeno peppers, and… the list could go on! I want to make the french onion soup next! Ooh! I saw this recipe on her site, too. I definitely need to try it now!! We don’t eat a lot of steak so maybe this will be a nice treat. I’ve tried quite a few of her recipes but the ones that I make on a regular basis are her Roasted Garlic Mashed Potatoes, Monday Night Stir Fry and Penne Alla Vodka except we use the sauce on the Costco Chicken Ravioli. I’m really enjoying Kay’s website too. The lady from Kayotic Kitchen that guest posts on PW. She has amazing pictures, too!! I may have to try the Steak Bite recipe now that you’ve raved about it! Would you believe, I just returned home from a party (I brought Pioneer Woman’s Yellow Cupcakes with Sticky Chocolate Icing but used her Cream Cheese Frosting from her Carrot Cake instead)and I’m now enjoying a piece of your Chocolate Chip Pie (I was sure I wouldn’t get a cupcake, so I made my family a treat they could look forward to at home!) Yum. I’m in dessert heaven! 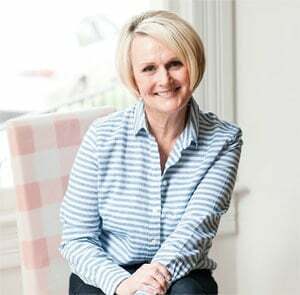 Pioneer Woman has great recipes. I love her Pico de Gallo and Carrot Cake. My husband swears he’s going to marry her. He loves her Marlboro Man’s favorite sandwich. I haven’t had a bad recipe from her website. Thanks for this amazing recipe. Is definitely going into the “To try” file. I’m telling! j/k, but I got a good laugh! I found Pioneer Woman through you and absolutely love her. I have to check her site before going to the grocery store to make sure she doesen’t have a new recipe up I want to try. My family loves Cheesy Olive bread and I love Asian Noodle Salad. Farfalle with Zucchini. So good! I beg to disagree with you on one point in your post, though. Your pictures do NOT pale by comparison! Love the Pioneer Woman! One of our favorites is the Chicken Spaghetti. Thanks for all your Pioneer Woman suggestions! Thinking that chocolate pie might have to be my next PW recipe!!! Would love to hear from more of you! Hi! 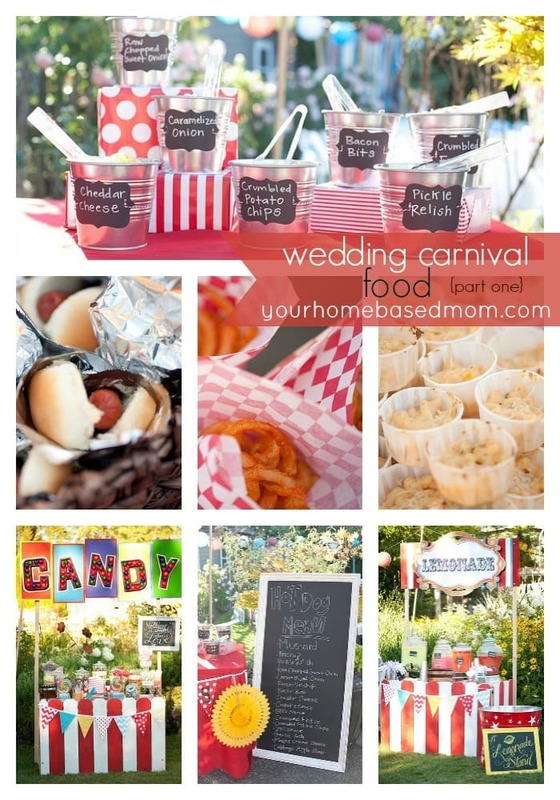 I found your blog not too long ago and I love it! I’ve been drooling over all your recipes! I haven’t tried the steak bites yet, but will have give them a shot! Thanks for all your yummy pictures! I can’t wait to try out your recipes too! I have made Pioneer Woman’s Pasta Primavera http://thepioneerwoman.com/cooking/2007/08/pioneer_womans_/ – I love it. If I had children or dinner parties I would make more of her recipes. That’s what I keep telling myself. Every time I go home to visit with my family I end up making something from the PW site because there are enough people to eat it all. 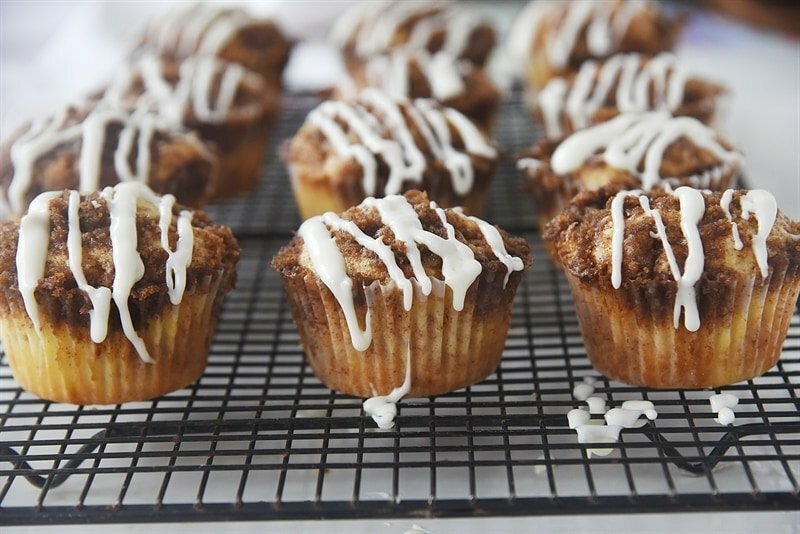 I have to say though – the banana bread from your site is still our very favorite. I’ve fixed her steak bites twice!! They are very good and so easy and nice to eat. I have made her cinnamon rolls. They were delicious too. I made her pico de gallo. I love her recipes and step by step photos. I guess I’l go fix some chicken fried steak. Don’t know if she has a recipe for that, I guess I’ll write my own. GB’s Ranch Grub. My mom has made her sandwich with the chilies, tomato, rye bread, cheese, and onions! It is definitely a hit at our house! Went to one of my kids house for a pot-luck dinner. I hadn’t planned well so at the last minute I grabbed a few steaks that were on sale and the other ingredients for these MAN-BITES. Everyone devoured them. They were so delicious. 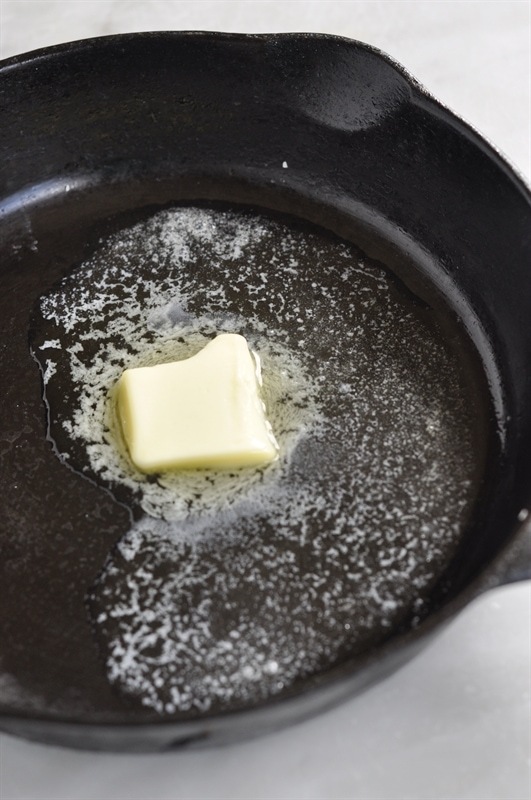 One of my sons is a chef and he thought it sac-religious to use a pan to cook steak in….until he wanted more! Great dish and perfect if you can never eat a whole steak. Hey there, happy 4th of July! I have a cute book for you to read, Delicious by Ruth Reitchl. She was the editor in chief of Gourmet Magazine. It’s fiction and about a lady that works at a food magazine that goes out of business. There is a cute twist involved. Also, I just started the Perfume Collector. I have read Ruth Reichl’s other books and really liked them. Will definitely check out Delicous! Thanks for the recommendation. Will also check out The Perfume Collector. Thanks for sharing this recipe! I am really new at cooking and your recipe is so easy that I attempted it and thanks to you, me and my husband had a great meal last night!! Love it! Glad it was a success for you Sharon! 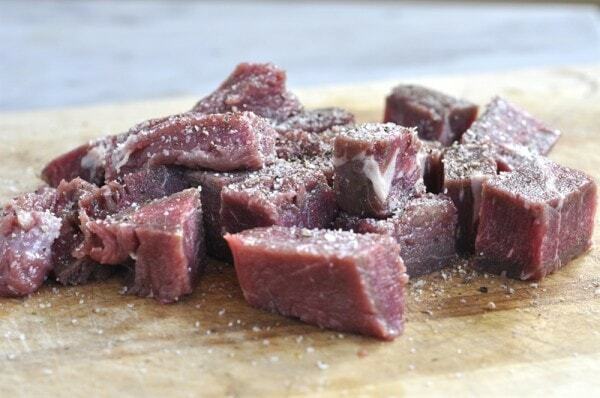 Being on a Low-Carb lifestyle, I love this recipe, and will soon try it with my Venison ! It should translate perfectly.. stay tuned if NOT ! LOL ! 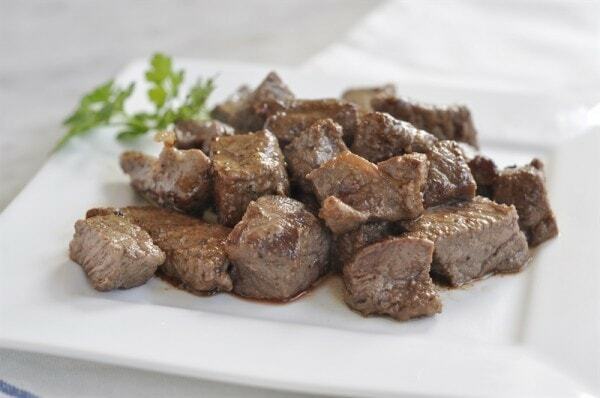 I love cooking venison in almost any beef-type recipe, and it’s Great Natural food ! thank you so much for this simple recipe. this is exactly what i need for tonight. Scrolling through Pinterest, I was so surprised to find this recipe! My grandfather who immigrated here from Belgium, would make this family favorite, as did my mother and now myself. It was called “dup” (?spelling) steak. Although there are a few differences, I’m sure it taste the same. 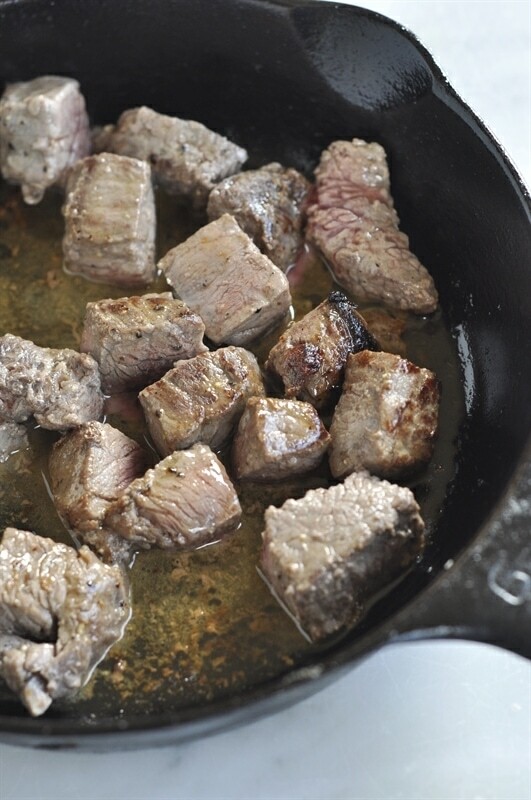 Using a hot cast iron pan, & butter, you add large pieces of round steak. After both sides are seared, fork each piece of steak and cut in half using a scissors, working very quickly (that’s the key) continue until you have a pan of small bite size pieces. Cutting the meat in different directions breaks the fibers to create tender bites, and the juices combine with the butter to make a delicious gravy. Hello! I’m new to your blog and am going to make these steak bites tonight over noodles. (I’m looking for a good gravy recipe to use for it too.) My question is this: Can I pan fry the steak in any other type of pan? And if so, how?? lol. Unfortunately I do not own a cast iron skillet. (I know, I know 😮) I’ve been meaning to get one, so I just might have to go buy one today. TJ Maxx usually has nice big ones for a great price. But just in case, your help would be greatly appreciated! Thanks a ton! Leanne, Yes, you can use whatever frying pan you have on hand but get yourself a cast iron one soon – you won’t regret it! These are even more yummy if you marinade them in a homemade Teriyaki sauce, just soy, brown sugar, fresh garlic and onion powder, refrigerate for a hours on the cute up steak . 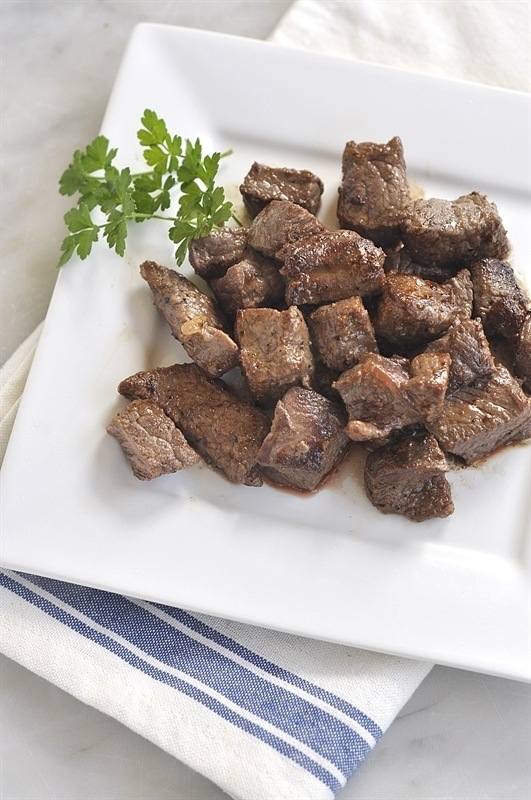 Then fry them up in a pan with butter, it carmilizes on the steak and so yummy you will want extra for leftovers! getting the pan hot before you start works best. Tracy, That’s a great idea – will give it a try. Teres major also known as shoulder tender would be perfect for this the have no heavy tissue , fat . They are almost as tender as a filet and pack lots of flavor . 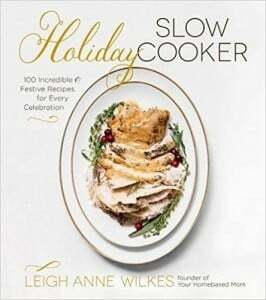 Hi Leigh Anne: In the past many months, I have been able to directly print off your recipes. Suddenly, I can’t do that. The option of “print” is there at the bottom of the picture, but the print button will not respond. Is there is change that has been made which I have missed? Help please. Connie, I did switch my recipe plugin. It will print for me. I’m wondering if it is a browser problem – what browser are you in? I made these tonight! So good. Great Pinterest find.